Many of the arguments around course completion in MOOCs are, I have argued, category mistakes, based on a false comparison with traditional HE, semester-long courses. We should not, of course, allow these arguments to distract us from making MOOCs better, in the sense of having more sticking power for participants. This is where things get interesting, as there have been some features of recent MOOCs that have caught my eye as providing higher levels of persistence among learners. The University of Derby ‘Dementia’ MOOC, full title ‘Bridging the Dementia Divide: Supporting People Living with Dementia’ is a case in point. MOOC learners are not undergraduates who expect a diet of lectures delivered synchronously over a semester. They are not at college and do not want to conform to institutional structures and timetables. It is unfortunate that many MOOC designers treat MOOC learners as if they were physically (and psychologically) at a University – they are not. They have jobs, kids, lives, things to do. MOOC designers have to get out of their institutional thinking and realize that their audience often has a different set of intentions and needs. The new MOOCs need to be sensitive to learner needs. To be sensitive to a variety of learners (see why course completion is a wrong-headed measure), the solution is to provide flexible approaches to learning within a MOOC, so that different learners can take different routes and approaches. Some may want to be part of a ‘cohort’ of learners and move through the course with a diet of synchronous events but many MOOC learners are far more likely to be driven by interest than paper qualifications, so make the learning accessible from the start. Having materials available from day one allows learners to start later than others, proceed at their own rate and, importantly, catch up when they choose. This is in line with real learners in the real world and not institutional learning. The idea of a strictly linear diet of lectures and learning should also be eschewed, as different learners want different portions of the learning, at different times. A more modular approach, where modules are self-contained and can be taken in any order is one tactic. Adaptive MOOCs, using AI software that guides learners through content on the basis of their needs, is another. 6.16% of the dementia MOOCs didn’t start with Module 1. 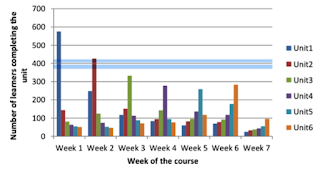 This tracked data shows that some completed the whole course in one day, others did a couple of modules on one day, many did the modules in a different order, some went through in a linear and measured fashion. Some even went backwards. The lesson here is that the course needs to be designed to cope with these different approaches to learning, in terms of order and time. This is better represented in this state diagram, showing the different strokes for different folks. Each circle is a module containing the number of completions. Design for flexibility. MOOC learners don’t need the 10-week semester structure. Some want much shorter and faster experiences, others medium length and some longer. Higher Education is based on an agricultural calendar, with set semesters that fit harvest and holiday patterns. The rest of the world does not work to this pre-industrial timetable. In the Derby Dementia MOOC, there is considerable variability on when people did their learning. 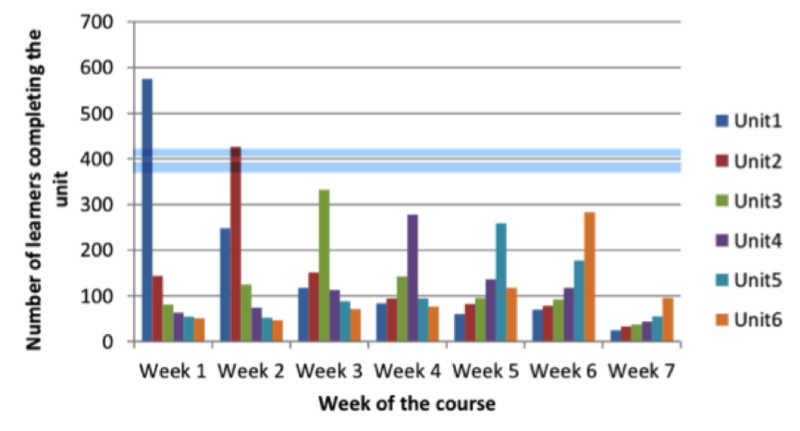 Many took less that the six weeks but that did not mean they spent less time on the course, Many preferred concentrated bouts of longer learning than the regular once per week model that many MOOCs recommend or mandate. Others did the week-by-week learning. We have to understand that learning for MOOC audiences is taken erratically and not always in line with the campus model. We need to design for this. I personally find the drip-feed, synchronous, moving through the course with a cohort, rather annoying and condescending. The evidence in the Dementia MOOC suggests that there was more learner activity in unsupported periods than supported periods. This shows a considerable thirst for doing things at your own pace and convenience, than that mandated by synchronous, supported courses. Nevertheless, this is not an argument for a wholly unstructured strategy. This MOOC attracted a diverse set of learners and having both structured and unstructured approach brought the entire range of learners along. You can see that the learners who experienced the structured approach of live Monday announcement by the lead academic, a Friday wrap-up with a live webinar, help forum and email query service was a sizeable group in any one week. Yet the others, who learnt without support were also substantial in every week. This dual approach seems ideal, appealing to an entire range of learners with different needs and motivations. Many have little interest in social chat and being part of a consistent group or cohort. One of the great MOOC myths is that social participation is a necessary condition for learning and/or success. Far too much is made of ‘chat’ in MOOCs, in terms of needs and quality. I’m not arguing for no social components in MOOCs, only claiming that the evidence shows that they are less important than the ‘social constructivist’ orthodoxy in design would suggest. In essence, I’m saying it is desirable but not essential. To rely on this as the essential pedagogic technique, is, in my opinion, a mistake and is to impose an ideology on learners that they do not want. In line with the idea of being sensitive to the needs of the learners, I’ve found too many rather earnest, talking heads from academics, especially the cosy chats, more suitable to the 18 year-old undergraduate, than the adult learner. You need to think about voice and tone, and avoid second rate PhD research and an over-Departmental approach to the content. I’m less interested in what your Department is doing and far more interested in the important developments and findings, at an international level in your field. MOOC learners have not chosen to come to your University, they’ve chosen to study a topic. We have to let up on being too specific in content, tone and approach. In another interesting study of MOOCs, the researchers found that stickiness was highly correlated to the quality of the 'content'. This contradicts those who believe that the primary driver in MOOCs is social. They found that the learners dropped out if they didn't find the content appropriate, or of the right quality and good content turns out to be a primary driver for perseverance and completion, as their stats show. The Dementia MOOC had six independent, self-contained sections, each with its own badge for completion, and each can be taken in any order, with an overall badge for completion. These partial rewards for partial completion proved valuable. It moves us away from the idea that certificates of completion are the way we should judge MOOC participation. In the Dementia MOOC 1201 were rewarded with badges against 527 completion certificates. MOOCs are made for all sorts of reasons, marketing, grant applications, even whim - this is supply led. Yet the MOOCs market has changed dramatically, away from representing the typical course offerings in Universities, towards more vocational subjects. This is a good thing, as the providers are quite simply reacting to demand. Before making your MOOC, do some marketing, estimate the size of your addressible audince and tweak your marketing towards that audience. Tis is likely to resultin a higher number of participants, as well as higher stickiness. If there's one thing that will get you more participants and more stickiness, it's good marketing. Yet academic institutions are often short of htese skills or see it as 'trade'. This is a big mistake. Marketing matters, it is a skill and need a budget. The researchers at Derby used a very interesting phrase in their conclusion, that “a certain amount of chaos may have to be embraced”. This is right. 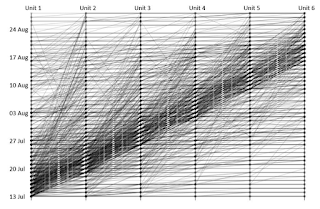 Too many MOOCs are over-structured, too linear and too like traditional University courses. They need to loosen up and deliver what these newer diverse audiences want. Of course, this also means being careful about what is being achieved here. Quality within these looser structures and in each of these individual modules must be maintained. Hadi, S. Gagen P. New model formeasuring MOOCs completion rates. Presentation at European MOOCs Stakeholder Summit. You can enrol for the University of Derby 'Dementia' MOOC here. And more MOOC stuff here. You write: "I’m not arguing for no social components in MOOCs, only claiming that the evidence shows that they are less important than the ‘social constructivist’ orthodoxy in design would suggest. " There are too many good ideas in this post, so I am forced to find something to have a minor argument about. I have attended a number of excellent MOOCs in my field of decision theory. For me, and I am in my late 50's with a PhD, to use the materials on special website I created to talk to 1 or 2 friends was very important. That is the type of social I need. Hi Michael. Thanks for your comment. To be clear, I am not arguing against the social component, only claiming that the data suggests that it is not as important as many claim. Some like it, some don't but some theorists claim that it is (and should be) the main component in all MOOCs. It's the relative importance, not the presence, of social in MOOCs that's important. Donald, I think we might be agreeing. Yes, I don't think that having "the" social component, a class forum, is necessary. But, many small groups -especially those groups comprised of older attendees- will benefit by constructing "a" social network, out of whatever networking materials they are using at the moment. Showing these groups how to access to these different social tools might be useful for the organizers. For example, the people I would like to talk to about Barry Nalebuff's class on negotiation are unlikely to actually be attending the MOOC. However, they are likely to be in some business LinkedIn group I moderate. Yip. We're on the same page. Great post, Donald. Michael, I'm really intrigued by your comments. I wonder if you or Donald have any thoughts on how content in MOOCs could be better packaged to facilitate the kind of external repurposing you find valuable (i.e. the example of your specialized website to facilitate learning and interaction with a few friends)? There are some basic things that came to my mind right away: simple, stable and easily discoverable URLs for each node of content, good semantic markup, etc. @Unknown, most MOOC's have the social assets readily available for downloads. But, perhaps I have mis-understood your question?